Tour campus and learn about our admission process as you start your college journey! Discover how you'll unleash amazing. Schedule a tour today! Attend our Nursing Preview Day Session to learn about our coursework, application and facilities. St. Cloud State University invites you to our “Be the Broadcaster” event on Thursday, April 30! If you are interested in a career in television or radio broadcasting, this is the perfect opportunity to visit campus and check out SCSU’s award-winning broadcasting program. Hear from SCSU alumni who are current professionals in the field. Participate in tours of our state-of-the-art radio and television facilities. Engage in hands-on experiences with the radio and television equipment. With 100 acres and 150 years of history, we have a lot to show you. Visit campus here on the banks of the Mississippi River in Central Minnesota to learn what St. Cloud State offers. See our academic buildings. Walk through our residential halls. Stop at our dining locations and sports facilities. Discover the opportunities for fun in our student center. Look around. Find your place at the Home of the Huskies. Greater St. Cloud offers big-city excitement, small-town convenience and rural resources. St. 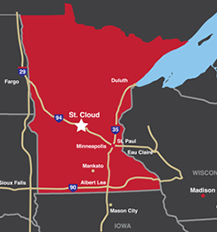 Cloud State sits astride North America's largest river and a key east-west freeway. Live music and theater are available in the arts district adjacent to campus. Just an hour away, Minneapolis and St. Paul offer world-class arts, entertainment, shopping and sporting events. Looking for Huskies Advising and Registration? Take a self-guided tour of campus and explore St. Cloud State at your leisure. Read about the local attractions to be found in St. Cloud. Discover what Minnesota has to offer. Find information about Minnesota's history, geography, climate and transportation at Explore Minnesota.